Bamboo rafting along the river. Encounter locals to discover their culture and daily life. Walk in the valley of rice terraces. A boat trip among the rice terraces and limestone mountains. 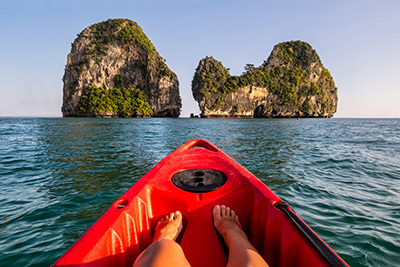 An overnight cruise in the middle of the magnificent Bai Tu Long Bay. Enjoy your breakfast at the village and transfer to Eo Ken, 30km away from Mai Hich. Arrive in Eo Ken where the Muong ethnic group lives. Walk down the slope and enjoy the spectacular view of Pu Luong Nature reserve, rice field terraces and mountains. Visit a Muong ethnic family in Eo Ken village and discover their authentic life. Continue walking through this beautiful landscape and cross a stream to reach another village, Hang Village. Have lunch at a local family home or enjoy a picnic. In the afternoon, transfer to Chieng Lau Village a beautiful rice field area with bamboo water wheels, and walk through the fields to the village and encounter the locals to discover their life, culture and customs. Another highlight of the day is taking a bamboo raft along the river which will give you an exceptional moment of relaxation after walking. Transfer to Don Village for dinner and stay overnight. Have breakfast at the homestay then enjoy a day of trekking to discover the Pu Luong Nature Reverse and its inhabitants. Start from Don Village and cross the rice terraces to Kho Muong village, the most remote village in Pu Luong, located in the valley and surrounded by the beautiful lime stone mountains and rice terraces. Kho Muong is home to a Thai ethnic group. Have your camera ready to capture the breathtaking scenery of rice terraces and encounter the locals en route. Lunch will be served in the homestay at Kho Muong Village. In the afternoon, continue following the trails in the forest and the manioc field to reach Uoi village, a beautiful village home to another Thai ethnic group who still preserve their thatched houses. Keep walking to Lan Ngoai Village before transferring back to your accommodation. Enjoy breakfast before saying good-bye to the host, then walk down to the spectacular rice terrace valley. Hike through small paths and to reach four picturesque villages, Leo, Mo, Chu and Danh. Don't forget your camera to capture these unforgettable moments. During the hike, you will enjoy the changing landscapes of rice terraces, villages, wild fields, ponds, streams and mountains. Meet our driver for a transfer to Van Long. On the way, visit the sacred fish stream in Cam Luong. This place is well known for a special kind of fish in the stream. It is called a sacred fish for the many mysterious stories created around this special creature. Continue to Van Long, an international nature reserve and stop again to visit Chau Son Monastery located in the romantic countryside of Nho Quan District, inspired by Gothic styles and built with red bricks in 1939. It is remarkable for its tranquility. Arrive in Van Long in the late afternoon and check in to your homestay where you will meet a typical 3-generation rural family. Be welcomed to their home with a cup of tea and learn about their idyllic local lifestyles through intimate conversation. After breakfast at homestay, enjoy a 15km bike ride ( or by car) and walk through the villages. A journey along the dyke will offer you gorgeous landscapes of rice fields, a river and limestone mountains. There are several stops for you to take beautiful photos or encounter the locals then walk to discover Thung La temple, dating back to the 11th century. Meet Mr Tuong, the temple guardian, and enjoy an authentic conversation as well as a 20 minute drum show. After breakfast, we will depart for Halong via Nam Dinh and Thai Binh province. These are famous for the extensive rice fields as far as your eyes can see will follow you along the way. Arrive in Hanoi in the afternoon.